Well, to answer the specifics about Lightroom CC and Classic, I’ll refer you to a few articles. What the Heck is (the new) Lightroom CC. Those cover most everything you’ll need to know about the Mobile and Desktop versions of Lightroom. And then there’s Vanelli’s article about if it’ll end up in his workflow which is great too. A lot of people still have questions about what this change means for their current systems and workflows. After the announcement, there was a LOT of negative and bewildered feedback towards Adobe. The confusing release notes left people thinking they were retiring or “sunsetting” the Adobe Lightroom we all know and love and focusing _solely_ on the mobile and cloud-based market, so to get to the bottom of things, I scheduled a one on one meeting with Lightroom’s Product Manager Tom Hogarty and here’s what he had to say. “Lightroom CC represents where we’re taking the future of Lightroom from a cloud-based multi-surface full photography service standpoint. We are very committed to Lightroom Classic, the Lightroom that they know and love, that is a more desktop-focused workflow, it supports the full range of professional functionality that people have standardized on over the past ten years and have really adapted their specific workflows, shooting thousands of images a day to Lightroom. So we remain very committed to Lightroom Classic. We announced innovations today, some very strong innovations in terms of performance and again, common selection techniques for Graduated Filters and we will continue to invest in Lightroom Classic while we’re building out photography storage with Lightroom CC. 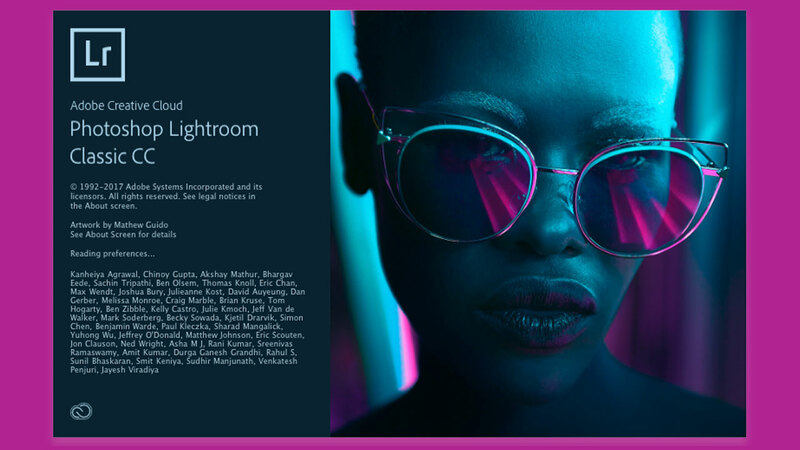 Lightroom Classic remains available as part of the $9.99 Creative Cloud Photography offerings, so you get Lightroom Classic, you get Photoshop, you get the 20-gigabytes with Lightroom CC as well, you get Portfolio, you get Spark Premium. So that offering is still in the market, and people can continue to buy that and enjoy it. As they try out the next generation of Lightroom Classic CC, they can migrate to that as they feel comfortable with the level of functionality. There are certain feature gaps between CC and Classic that people will use and depend upon professional workflows, it’ll take us a while to actually build those out and get everything out there for the next generation of Lightroom. So we have the $9.99 offering that is what we call the Photography plan today. All right, that’s the core. We have the $9.99 offering for the new Lightroom CC, and that’s the fully integrated photography service with a terabyte of storage. So we basically have an offering for everyone in photography at this point, but the Lightroom Classic customers can rest assured that we understand their need, we understand the workflows, and we know what we have to migrate over time to the new platform, and we remain very committed to that product. “We knew there might be some reaction to the classic as a sun-setting term, it’s absolutely not in this case. I can only reassure people so much, so it is on us to prove it with more innovation of more updates for that product. We did that with our investment of performance with this release, it also has the latest and greatest image editing enhancements, and we keep adding to that, so my request of the Lightroom community would be, hold us accountable, we’ll do another update shortly and if we’re not meeting your expectations, tell us. But I think after a decade of continuing to innovate with that product they’ll give us the benefit of the doubt, we’ll keep doing it. Again, I’ve been managing this product line since day one, so I’m heavily invested. Now, from the second user viewpoint that looks at LRCC and says, “No way. I shoot this much per week.” We wanna hear from those guys because they’re talking about how their workflow might fit with the 1.0 application. So, what are their expectations? What portion of their workflow do they expect to be connected and cloud-centric, and what portion of their workflow do they expect to keep local and not in the cloud. Because one common misnomer is that you don’t need to be connected to the cloud to continue working from CC. You can be out in the field on safari and dump a terabyte of images into Lightroom CC and you’re good to go. It’s just waiting until you get connected. So you can have your entire workflow start to finish done before you even connect to the internet. This is the way it behaves now. If you’re connected to the internet, you put a terabyte, that terabyte will go to upload to the cloud. However, and this is where we want to start the dialogue with the community, do they want more of a selective sync environment? Do we want to do, where okay, you designate your only flagged images and four-star or greater go to the cloud? Keep the other stuff local and don’t sync? Those are the kind of workflow discussions we need to start having. But we wanted to set the tone with this 1.0 option, this is truly a cloud-based experience. If we can start to backfill some of the selective sync workflows, that would be great. Again, that’s 1.0. So that’s the two-fold. That’s a classic workflow or is that a, “Can I choose to not have this part of the cloud?” For anyone in that situation now, classic. Because we don’t have the functionality to allow selective sync in Lightroom CC yet. Just to reemphasize, I am not alone in the fact that I have images in my library that I do not want to be synced to the cloud. They’re in the cloud now, because I’m the project manager and that’s my job, but as soon as we add that functionality, I am going to designate a set of images that don’t go on it. Lightroom isn’t going anywhere, so everyone can calm down. In fact, in the coming years, Lightroom will only continue to improve and be added too, all the while the CC (aka mobile/cloud platform) will continue to expand and have more features from “Classic” added too it. When I asked the Lightroom team directly, they said the only way Lightroom classic would ever “go away” is if the Lightroom CC product has every single feature (and more) that currently exists in the “Classic” version giving the user the ability to fully choose and customize their desktop and cloud-based experience. Now that we know the desktop version isn’t going away, and for no difference in price, we can choose our own path and workflows as we need, the question remains, should I update to the latest version now? Well, my personal opinion as far as Lightroom and Photoshop are concerned….it’s a hard NOT YET! Why? Well, so far the bugs and complaints have been flowing in from colleagues and other users around the globe. While the new features look fantastic, there’s still a lot broken in this update and if you’ve got clients to deliver for in a timely fashion, I’d wait a few more weeks before pulling the “update” trigger. As of right now, I’ve compiled a list of bugs with Lightroom Classic that I’ve encountered and have verified with other users in the field that have placed my system in a nearly unusable state. I’ve been working directly with Adobe Engineers to troubleshoot and help get these fixed….but as I said, it’s probably best if you haven’t already updated, to wait a few more weeks till things are completely patched up. Preview files are OBSCENELY large compared to the previous update. Pre-classic my preview file was 430 megs, now with LR Classic CC, it’s 5.73 GIGS! So, as you can see, there’s still a lot of things the latest Lightroom update has to work out. The new features are admittedly pretty freaking amazing, but I highly recommend keeping your old version of Lightroom if you plan on installing Classic…at least for now. Here’s my own big complaint about the new Lightroom CC. I am a Creative Cloud subscriber, using a lot of the Adobe applications. And they don’t seem to have thought about users like me. I tried to switch over to Lightroom CC. (The multi-device stuff would be a huge plus for me.) I’ve got lots of photos, so will need more than the 100 GB that comes free with the CC subscription. I tried to purchase more web space – managed after a good deal of searching to find a link that let me expand my online storage by 1TB. But Lightroom CC will not recognize it. I’ve spend a fair amount of time with Adobe support trying to figure this out. No luck. As near as I can tell, they must never have tested this case. Because it doesn’t work, not even a little. Speaking as an amateur who subscribes to the photography plan the new LR Classic has been working fine for me. It works well between itself, PS and Bridge. My only real complaint is that LR Classic takes ages to load, but once it gets there it has been very stable so far. I have no issues with backing up or finding libraries and collections. Not at all interested in the cloud based edition, but I can see the benefit for professionals.